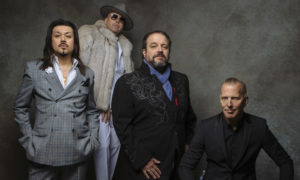 Presented by the Camden County Board of Freeholders in association with BRE and the Borough of Collingswood, the Scottish Rite Auditorium welcomes The Mavericks “Hey! Merry Christmas!” Tour! on Saturday, December 8th 2018. Doors open at 7 PM, showtime at 8 PM. Get ready for a night of dancing and fun as the genre-defying Mavericks put their own twist on the holidays, in support of their upcoming album, Hey! Merry Christmas. The night will include classic hits along with fresh material from The Mavericks’ latest, Brand New Day. Their category-defying approach has been a unique hallmark of The Mavericks’ sound since the band’s top-20 hits on the country charts. Join us for a new Christmas tradition the whole family will enjoy!